Free Printable Bullying Stops Here Sign. Free Printable Bullying Stops Here Sign that you can use at school or activities against bullying to inform that no bullying is allowed. This is a great sign to show support to students at school or the community. Use at any anti-bullying awareness or prevention month activity in October to stand up against bullying. Print this Bullying Stops Here Sign free using your home or office laser or inkjet printer, and affix on doors, entrance, windows, walls, cars, etc. 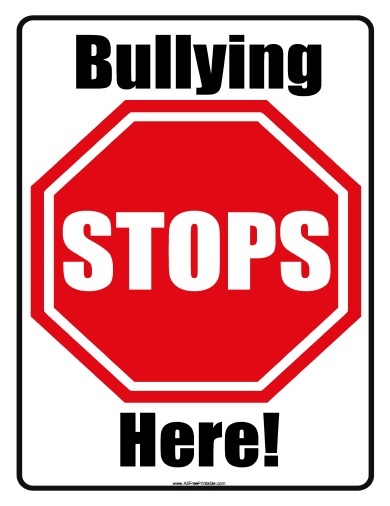 You can use your printable Bullying Stops Here Sign as a temporary sign, but if you want it to last more time you can protect with contact paper before using. Click the link to download or print the Bullying Stops Here Sign free in PDF format. Stop Bullying Now!